Dendritic cells (DC) can produce Th-polarizing cytokines and direct the class of the adaptive immune response. Microbial stimuli, cytokines, chemokines, and T cell-derived signals all have been shown to trigger cytokine synthesis by DC, but it remains unclear whether these signals are functionally equivalent and whether they determine the nature of the cytokine produced or simply initiate a preprogrammed pattern of cytokine production, which may be DC subtype specific. Here, we demonstrate that microbial and T cell-derived stimuli can synergize to induce production of high levels of IL-12 p70 or IL-10 by individual murine DC subsets but that the choice of cytokine is dictated by the microbial pattern recognition receptor engaged. We show that bacterial components such as CpG-containing DNA or extracts from Mycobacterium tuberculosis predispose CD8α+ and CD8α−CD4− DC to make IL-12 p70. In contrast, exposure of CD8α+, CD4+ and CD8α−CD4− DC to heat-killed yeasts leads to production of IL-10. In both cases, secretion of high levels of cytokine requires a second signal from T cells, which can be replaced by CD40 ligand. Consistent with their differential effects on cytokine production, extracts from M. tuberculosis promote IL-12 production primarily via Toll-like receptor 2 and an MyD88-dependent pathway, whereas heat-killed yeasts activate DC via a Toll-like receptor 2-, MyD88-, and Toll/IL-1R domain containing protein-independent pathway. These results show that T cell feedback amplifies innate signals for cytokine production by DC and suggest that pattern recognition rather than ontogeny determines the production of cytokines by individual DC subsets. Induction of an appropriate class of adaptive immune response is essential for protection from many infections and APCs play a critical role in this process. APC function is largely regulated by direct recognition of pathogens or indirect sensing of correlates of infection such as cell damage or inflammation (1). Direct recognition involves APC-expressed pattern recognition receptors (PRRs),3 such as members of the Toll-like receptor (TLR) family (2, 3). Many of the microbial ligands for TLRs have remarkably similar effects on APC, generally characterized by the induction of proinflammatory cytokines and IL-12 (2, 3). This suggests that TLR recognition may be primarily involved in the generation of inflammatory immune responses and that other classes of PRR involved in the generation of noninflammatory adaptive immunity await identification. This is further supported by the observation that mice deficient for MyD88, a critical adapter in TLR signaling for cytokine production, mount defective Th1-type responses but have normal type 2 immune responses (4). Dendritic cells (DC) are the major APC in the initiation of adaptive immune responses. DC can produce Th-polarizing cytokines, but it is still unclear how cytokine production by DC is regulated and matched to pathogen recognition (1, 5, 6). Given the existence of multiple DC subsets, it has been argued that some may be specialized to produce IL-12 and drive Th1 responses whereas others induce Th2 immunity. In this model, such DC1 and DC2 subsets possess mutually exclusive sets of PRR and respond to distinct groups of pathogens (7). This has been shown for human monocyte-derived vs plasmacytoid DC (8, 9, 10), although at present no publications have addressed whether mouse DC subsets also differ in PRR expression. An alternative model is that individual DC subsets are not necessarily preexisting DC1 or DC2 but respond in a flexible manner to distinct pathogens and make distinct cytokines depending on which PRR are triggered (1, 6, 11). We have previously concentrated on the mechanisms leading to IL-12 production by DC (12, 13). Here, we focus on the roles of microbial stimulation and T cell feedback on production of two opposing cytokines, IL-12 and IL-10, by distinct DC subsets. We demonstrate that production of high levels of either IL-12 or IL-10 by murine splenic DC requires two signals, one from a microbe and the other from T cells. Microbial stimuli can act directly on DC via TLR and non-TLR PRRs, whereas T cell signals can be replaced by CD40 ligand (CD40L), but the microbial stimulus and not the T cell signal dictates which cytokine is produced. Importantly, we demonstrate that differential IL-10 and IL-12 production by DC is not attributable to the activity of specialized IL-12- or IL-10-producing DC subsets. Our results support the notion that DC subsets possess significant plasticity in their cytokine response and show that T cell feedback signals amplify a program established by pattern recognition. Male and female 6- to 10-wk-old mice were obtained from Charles River (Margate, U.K.), Harlan U.K. (Bicester, Oxon, U.K.) or from the breeding unit of Cancer Research U.K. (Clare Hall, South Mimms, U.K.). C57BL/6 (B6), B10.BR, BALB/c, C3H/HeN, and C3H/HeJ mice were used interchangeably, after determining that the responses studied were strain independent (not shown). The strain used for each experiment is indicated in each figure legend. DO11.10 mice (14) on a BALB/c-scid background were bred at Cancer Research U.K.
To analyze DC genetically deficient for MyD88 or TLR2, bone marrow chimeras were made by reconstituting lethally irradiated CD45.1 B6.SJL mice with congenic bone marrow from CD45.2 TLR2−/− or MyD88−/− mice on a C57BL/6 × 129 background (15, 16). Control chimeras were made with bone marrow taken from control C57BL/6 mice. DC were purified from the spleens of recipients 5–8 wk after reconstitution (17). Soluble tachyzoite Ag (STAg) was prepared from tachyzoites of the RH 88 strain of Toxoplasma gondii (12). Zymosan (Sigma, Poole, U.K.) was boiled for 30 min and washed twice in PBS. Laboratory cultures of Saccharomyces cerevisiae (strain K700) and Schizosaccharomyces pombe (strain 513) were autoclaved and washed twice in PBS. Escherichia coli LPS was a gift from Dr. S. Vogel (Uniformed Services University of the Health Sciences, Bethesda, MD). CpG-containing DNA was a phosphorothioate-linked oligonucleotide with the sequence TCC ATG ACG TTC CTG ATG CT (18). Purified protein derivative (PPD) of Mycobacterium tuberculosis was obtained from Statens Serum Institut (Copenhagen, Denmark). All microbial stimuli were used at saturation unless otherwise indicated. The OVA peptide 323–339 (OVA peptide; ISQAVHAAHAEINEAGR), Toll/IL-1R domain containing protein TIRAP peptide, and control peptide (19) were made by the Cancer Research U.K. peptide synthesis service. Endotoxin levels in all reagents were significantly lower than the minimum required for DC activation. The cell lines 3T3-CD40L and 3T3-SAMEN (control) were a gift from Dr. P. Hwu (National Cancer Institute, Bethesda, MD) and were derived from NIH 3T3 by stable transduction with murine CD40L or empty vector. Spleen cell suspensions were prepared by Liberase CI (Roche Diagnostics, Lewes, U.K.) and Dnase I digestion (13). DC-enriched fractions were prepared by labeling splenocytes with anti-CD11c MACS beads (Miltenyi, Bisley, U.K.) for 10 min at 4°C, followed by washing and positive selection using LS magnetic columns (Miltenyi Biotec), as described (13). Resulting preparations contained 70–95% CD11cbright DC. To obtain DC subsets, CD11c-enriched preparations were further stained with PE-anti-CD11c, FITC-anti-CD4, and TriColor-anti-CD8α (Caltag, Burlingame, CA) and sorted on a MoFlo cytometer (Cytomation, Fort Collins, CO). To obtain pure CD45.2+ DC from bone marrow chimeras, CD11c-enriched splenocytes were stained with PE-anti-CD11c and FITC-anti-CD45.1 and sorted for CD11cbrightCD45.1− cells, as described (17). 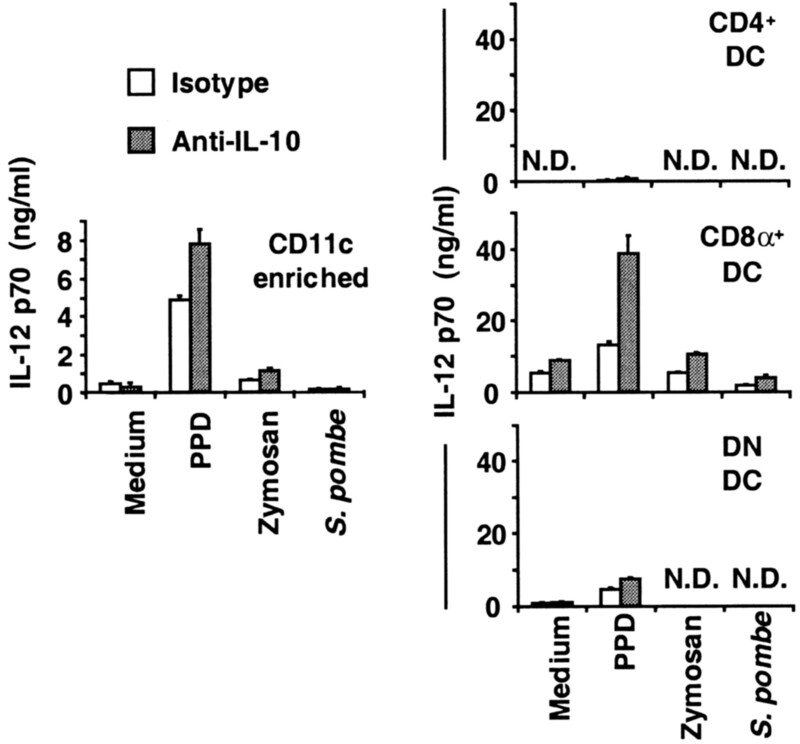 T cells were purified from the lymph nodes of DO-11.10/scid mice by negative selection of contaminating cells. For in vitro stimulation, MACS-enriched or FACS-sorted DC were cultured in 96-well flat-bottom plates alone or on a monolayer of CD40L-expressing or control fibroblasts. Cultures were incubated in the presence or absence of different stimuli in RPMI 1640 supplemented with 10% FCS, penicillin (100 U/ml), streptomycin (100 μg/ml), glutamine (2 mM), and 2-ME (5 × 10−7 M). Culture supernatants were collected at 18–24 h and assayed for the presence of cytokines by sandwich ELISA. Ab pairs were (capture, detection): 9A5, C17.8 (biotinylated) for IL-12 p70; JES5-2A5, SXC-1 (biotinylated) for IL-10. Cells were recovered in PBS plus 5 mM EDTA for FACS analysis. For analysis of DC maturation, cells were washed and stained in PBS containing 5 mM EDTA, 1% FCS, and 0.02% sodium azide (FACS wash). Cells were stained with FITC-conjugated anti-CD40 or anti-CD86 plus PE-conjugated anti-CD11c in the presence of 5 μg/ml anti-FcγRII/III. In some experiments, biotinylated anti-CD40 was used, followed by streptavidin conjugated to an appropriate fluorophore. The mAbs used were: HL3 and 16-10A1, hamster IgG mAbs against CD11c and CD80, respectively; NLDC-145, RM4-5, 53-6.7, 3/23, and GL1, rat IgG2a mAbs against DEC-205, CD4, CD8α, CD40, and CD86, respectively; JES5-2A5, rat IgG1 neutralizing mAb against IL-10; A20, mouse IgG2a mAb against CD45.1. All mAbs were from BD PharMingen (San Diego, CA) or produced in house. Single cell staining for IL-10 was performed using the mouse IL-10 secretion assay kit (Miltenyi Biotec). CD11c-enriched spleen cells were divided into two fractions. One half was stained with FITC-anti-CD11c and kept live; the remainder was stained with TriColor-anti-CD11c and then fixed by treating with 1% paraformaldehyde in PBS for 10 min at room temperature, followed by quenching with 1 mM glycine in PBS. A 1:1 mixture of live and fixed cells in medium was then cultured with control fibroblasts or with zymosan (50 μg/ml) plus CD40L-expressing fibroblasts for 4 h in 24-well plates. Cells were harvested and coated with anti-IL-10 capture reagent, then recultured at 2.5 × 105 DC/well in six-well plates with fresh fibroblasts ± zymosan stimulation as above. After 60–100 min, cells were harvested once more, washed in PBS containing 2 mM EDTA plus 1% FCS, and stained with PE-conjugated anti-IL-10 (Miltenyi Biotec) and APC-anti-CD8α. Intracellular staining for IL-12 was performed as described (13) using anti-IL-12 p40 (clone C17.15.10), anti-IL-12 p70 (clone 9A5) or a mixture of isotype-matched RtIgG2a and RtIgG2b irrelevant control Abs, followed by biotinylated mouse anti-rat (Jackson ImmunoResearch Laboratories, West Grove, PA) and PE- or APC-streptavidin (BD PharMingen). Cell acquisition was performed on a FACSCalibur flow cytometer (BD Biosciences, San Jose, CA), and data were analyzed using FlowJo software (Tree Star, San Carlos, CA). Several microbial stimuli were tested for their ability to act as activators of primary mouse DC in vitro. DC-enriched spleen cells were plated with or without test stimuli, and expression of the activation markers CD40, CD80, and CD86 was measured on CD11cbright cells after overnight culture. Culture alone was sufficient to induce up-regulation of CD40, CD80, and CD86 (not shown). Nevertheless, a wide range of products from bacteria, fungi, or protozoa were able to increase CD40, CD80, and CD86 expression further (Fig. 1⇓). They included mycobacterial PPD, heat-inactivated yeasts (Saccharomyces cerevisiae, S. pombe) and zymosan (yeast cell walls), as well as established murine DC activators such as STAg (12) and CpG-containing DNA oligonucleotides (CpG DNA) (Fig. 1⇓). All test agents induced CD40, CD80, and CD86 up-regulation to a similar extent in DC from control C3H/HeN- and TLR4-deficient C3H/HeJ mice, demonstrating that they did not contain endotoxin (data not shown). DC activation by different microbial stimuli. CD11c-enriched B6 or BALB/c spleen cells were cultured overnight with the indicated agents and then stained for CD11c, CD40, CD80, or CD86 and analyzed by flow cytometry. 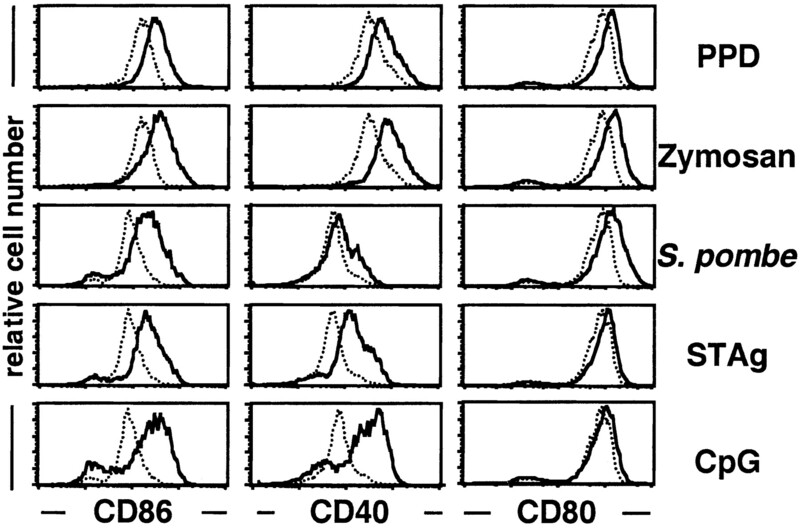 Histograms show gated CD11cbright cells. Increased CD40, CD80, and CD86 expression was seen on DC cultured with test stimuli (solid lines) vs medium alone (dotted line). Doses: CpG DNA, 1.5 μg/ml; STAg, 5 μg/ml; S. pombe, 2 × 105 particles/well; zymosan, 50 μg/ml; PPD, 10 μg/ml. Data shown are from multiple experiments. Similar results were seen in more than four experiments performed with each stimulus in various mouse strains. STAg and CpG DNA by themselves elicited modest levels of IL-12 p70 (<1 ng/ml) but no IL-10 from DC-enriched splenocyte populations (Fig. 2⇓A). However, little accumulation of IL-12 p70 or IL-10 in culture supernatants was seen in response to any of the other stimuli (Fig. 2⇓A, top). Because IL-12 p70 production by DC is markedly dependent on a second T cell-derived signal (13), we assessed the effect of CD40 coligation on the cytokine response. Culturing DC-enriched splenocytes on a monolayer of CD40L-expressing fibroblasts was sufficient to induce low levels of IL-12 p70 and IL-10 (Fig. 2⇓A). Addition of STAg and CpG DNA caused a significant increase in IL-12 p70 but not in IL-10 levels (Fig. 2⇓A, bottom). Similar results were obtained with PPD, although IL-12 p70 production in response to PPD was consistently lower than to STAg or CpG DNA (Fig. 2⇓A, bottom). In contrast, the combination of zymosan or S. pombe together with CD40L led to an increase primarily in IL-10 (Fig. 2⇓A, bottom). Similar induction of IL-10 was seen with a pathogenic yeast, Candida albicans, in combination with CD40L (data not shown). Neutralizing Ab to IL-10 did not increase the levels of IL-12 p70 in response to CD40L plus yeasts or zymosan (see below). When IL-12-promoting stimuli (e.g., CpG DNA) and IL-10-promoting zymosan were combined in the presence of CD40L, there was a significant decrease in IL-12 production (Fig. 2⇓B), consistent with the known ability of IL-10 to suppress IL-12 synthesis, and a slight decrease in IL-10 production (Fig. 2⇓B). These results demonstrate that CD40 triggering in DC does not inevitably lead to IL-12 synthesis but can reveal production of IL-10. CD40L or T cell feedback leads to production of either IL-12 p70 or IL-10 by DC following microbial activation. A, CD11c-enriched BALB/c spleen cells (70% DC; 4 × 104/well) were cultured overnight on a monolayer of CD40L-expressing or control fibroblasts together with DC-activating agents. Doses: STAg, 5 μg/ml; CpG DNA, 1 μg/ml; PPD, 10 μg/ml; zymosan, 10 μg/ml; S. pombe, 105 particles/well. B, DC as in A were cultured on a monolayer of CD40L-expressing fibroblasts together with CpG DNA (1 μg/ml) and/or zymosan (10 μg/ml). C, DC as in A were cultured with DO11.10 naive T cells (2 × 105 total cells/well; DC:T cell ratio, 1:1) in the presence or absence of STAg (1 μg/ml), PPD (5 μg/ml), or S. pombe (8 × 104 particles/well). OVA peptide was added as indicated, and the cells were cultured overnight. IL-12 p70 and IL-10 in culture supernatants were measured by ELISA. Histograms represent the mean of triplicate wells; all error bars are shown and represent 1 SD from the mean. N.D. (not detectable) indicates that the value was below the detection limit of the ELISA (<100 pg/ml IL-12 p70, <100 pg/ml IL-10). Data are representative of more than four experiments for each stimulus with CD40L-expressing fibroblasts and of three experiments with T cell feedback and with mixtures of stimuli. To examine whether physiological levels of T cell feedback signals could substitute for CD40L-expressing fibroblasts, naive TCR transgenic T cells were cultured with DC-enriched populations ± Ag in the presence of IL-12- or IL-10-promoting stimuli. In the absence of microbial stimuli, IL-12 p70 or IL-10 levels were low or undetectable even after T cell activation by Ag (Fig. 2⇑C). Microbial stimulation in the absence of Ag elicited only low levels of IL-12 p70 or IL-10. However, in the presence of OVA peptide, the yeasts triggered accumulation of IL-10 but not of IL-12 p70, whereas the opposite was seen with PPD and STAg (Fig. 2⇑C). As expected, cytokine accumulation in supernatants was Ag dose dependent (Fig. 2⇑C). These results using naive T cells agree with the data obtained with CD40L-expressing fibroblasts. However, anti-CD40L did not entirely block the effect of T cells in this system (R. Spörri and C. Reis e Sousa, unpublished observations), implying that other molecules expressed by naive T cells after activation can also provide feedback signals to amplify DC cytokine production. Inclusion of the microbial stimuli did not affect subsequent T cell proliferation although it had marked effects on Th differentiation (S. P. Manickasingham, A. D. Edwards, and C. Reis e Sousa, manuscript in preparation). The use of partially purified DC preparations in the experiments described above raised the possibility that the measured cytokines were produced by contaminating leukocytes or indirectly by DC in response to signals made by the contaminating cells. To address this issue, CD11cbright pure DC were sorted by FACS and stimulated with microbial products in the presence of CD40L-expressing fibroblasts. Purified DC responded to CpG DNA and PPD by producing IL-12 p70 but only small amounts of IL-10, whereas the converse was seen with zymosan (Fig. 3⇓, A and B). These results demonstrate that DC themselves can directly recognize and discriminate among microbial stimuli and can produce either IL-10 or IL-12 in response to the appropriate combination of signals. 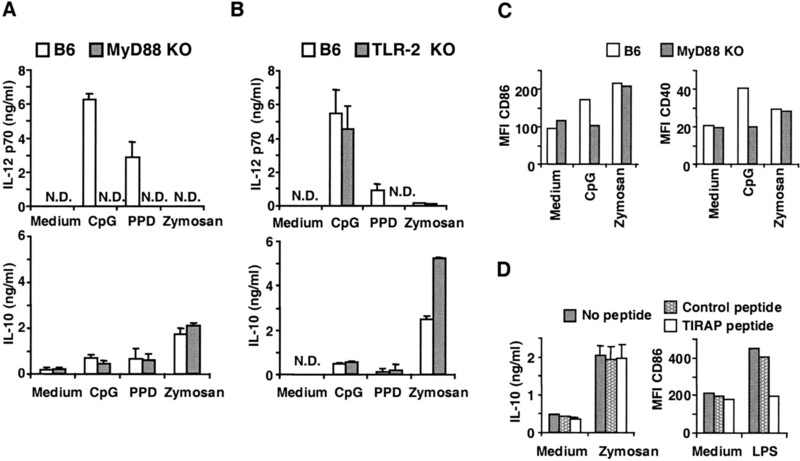 TLR2 and MyD88 are required for the IL-12 p70 response to PPD, but the response to zymosan is TLR independent. CD11cbright CD45.1− donor-derived spleen DC were purified from radiation chimeras of B6.SJL (CD45.1+) mice reconstituted with bone marrow from CD45.2+ MyD88−/−, TLR2−/−, or control B6 mice. A, Purified MyD88−/− or control DC were cultured overnight at 3 × 104/well with the indicated stimuli on a monolayer of CD40L-expressing fibroblasts. Cytokine levels in supernatants were measured by ELISA after 24 h. B, Similar to A but comparing TLR2−/− vs B6 DC. Doses: CpG, 1 μg/ml; PPD, 20 μg/ml; zymosan, 10 μg/ml. C, CD40 and CD86 expression on MyD88−/− or control DC was analyzed by flow cytometry after overnight culture with the indicated stimuli. D, CD11c-enriched BALB/c splenocytes (90% DC; 105/well) were pretreated for 1 h with 10 μM TIRAP or control peptide. Cells ± peptides were stimulated overnight with zymosan (10 μg/ml) on CD40L-expressing fibroblasts and analyzed for IL-10 production (left). As a positive control, the same cells ± peptides were stimulated overnight with LPS (0.5 ng/ml), and CD86 expression on DC was analyzed by flow cytometry (right). MFI, Median fluorescence intensity of gated CD11cbright cells. Histograms represent the mean of triplicate wells; all error bars are shown and represent 1 SD from the mean. N.D., not detectable. Data are representative of two experiments with MyD88−/− DC, three experiments with TLR2−/− DC, and two experiments with TIRAP-peptide. KO, Knockout. MyD88 is a critical adapter for the transduction of signals from many TLRs, including TLR9 and TLR2, which have been implicated in innate recognition of CpG DNA and zymosan, respectively (20, 21, 22). We examined whether MyD88 was required for the response to CpG DNA, PPD, or zymosan. MyD88-deficient DC were purified from the spleens of mice reconstituted with bone marrow from MyD88−/− mice and were compared with DC purified from control chimeras (see Materials and Methods). As shown in Fig. 3⇑A, MyD88−/− DC did not make IL-12 p70 in response to CpG DNA and PPD plus CD40L. 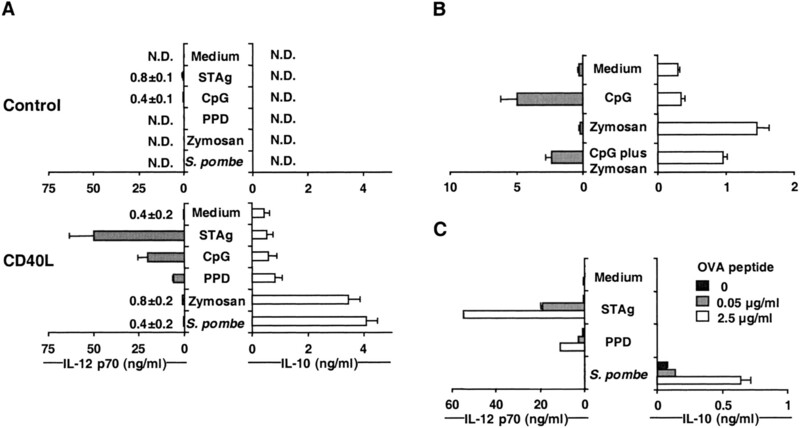 In contrast, MyD88 deficiency did not affect the IL-10 response to zymosan plus CD40L (Fig. 3⇑A). Likewise, the up-regulation of CD40 or CD86 in response to zymosan alone was MyD88 independent although, as expected, this adapter was critical for the response to CpG DNA (Fig. 3⇑C). A similar comparison revealed that TLR2 was also not necessary for IL-10 production in response to zymosan plus CD40L (Fig. 3⇑B). However, TLR2−/− DC made significantly lower levels of IL-12 p70 in response to PPD plus CD40L (Fig. 3⇑B). This was not due to a general defect in the ability of such DC to make IL-12 p70 because the same cells mounted a normal response to CpG DNA (Fig. 3⇑B). An additional adapter in TLR signaling, TIRAP/MAL, has been described (19, 23). As expected, a TIRAP-inhibitory peptide but not a control peptide containing the reversed TIRAP sequence (19) abrogated the LPS-induced up-regulation of CD86 by DC (Fig. 3⇑D). However, the TIRAP-inhibitory peptide did not affect yeast conditioning for IL-10 production (Fig. 3⇑D). These results demonstrate that TLR2 and MyD88 signaling mediate PPD conditioning of DC for CD40-triggered IL-12 p70 production but suggest that TLR signaling is not involved in conditioning by yeasts for IL-10 production. Spleen DC contain several subsets, which may possess distinct abilities to produce cytokines (24, 25). We addressed the ability of three of these subsets to make IL-10 vs IL-12. 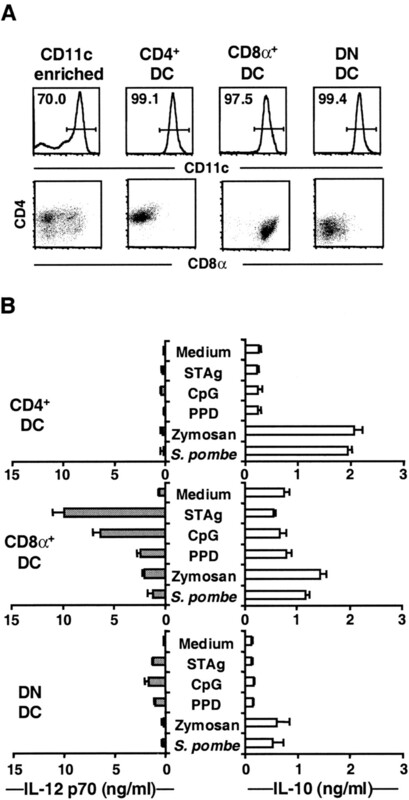 Homogeneous populations of CD11cbrightCD8α+, CD4+, and CD8α−CD4− (double-negative; DN) DC were isolated by cell sorting (Fig. 4⇓A). In the presence of control fibroblasts, all DC subsets produced only negligible amounts of IL-12 p70 or IL-10 (not shown). Coculture with CD40L-expressing fibroblasts alone was sufficient to increase the basal production of IL-12 p70 by CD8α+ DC and of IL-10 by all subsets (Fig. 4⇓B). Nonetheless, basal cytokine levels were markedly altered by addition of a microbial costimulus. CD8α+ and DN DC produced primarily IL-12 p70 in response to CpG DNA, STAg, or PPD in combination with CD40L although DN DC produced less IL-12 p70 than CD8α+ DC (Fig. 4⇓B). Both CD4− subsets also increased production of IL-10 in response to the combination of zymosan or S. pombe plus CD40L (Fig. 4⇓B). This was less obvious for CD8α+ DC, which displayed the highest level of basal IL-10 (and IL-12 p70) production in response to CD40L alone but remained statistically significant (p < 0.01) (Fig. 4⇓B). Zymosan also triggered a small amount of IL-12 p70 production by CD8α+ DC in some experiments (Fig. 4⇓B). Interestingly, CD4+ DC failed to make IL-12 p70 in response to any stimulus although they responded to yeast or zymosan plus CD40L by producing high levels of IL-10 (Fig. 4⇓B). Differential cytokine production by individual DC subsets. A, FACS analysis of sorted B6 DC subsets. Histograms show the CD11c profile of each population; numbers show the percentage of events corresponding to CD11cbright cells. Dot plots show CD4 vs CD8α profiles of CD11cbright cells, gated as indicated on the histograms. B, DC subsets sorted as in A were plated at 4 × 104 cells/well on a monolayer of CD40L-expressing fibroblasts with the indicated microbial stimuli. After overnight incubation, IL-10 and IL-12 p70 levels in supernatants were measured by ELISA. Doses: CpG DNA, 1 μg/ml; STAg, 5 μg/ml; PPD, 10 μg/ml; zymosan, 10 μg/ml; S. pombe, 5 × 104 particles/well. Histograms represent the mean of triplicate wells; all error bars are shown and represent 1 SD from the mean. Data are representative of seven independent experiments. IL-10 secretion by CD8α+ DC has not previously been reported. To assess the frequency of IL-10-producing CD8α+ DC, we used a staining method involving IL-10 capture by cell surface-bound Abs followed by detection with a second anti-IL-10 Ab conjugated to a fluorophore (see Materials and Methods). To confirm that the staining method identified only those cells producing IL-10 and not CD8α+ DC that passively captured cytokine secreted by neighboring cells, the experiments were conducted with a mixture of live and fixed DC; 20–30% of live CD8α+ DC stained for IL-10 after zymosan plus CD40L stimulation, whereas fixed CD8α+ DC in the same cultures did not stain for the cytokine (Fig. 5⇓A). However, both live and fixed cells could be stained to the same extent if incubated with exogenous IL-10 (Fig. 5⇓A). In all cases, there was no staining above background when the capture reagent was omitted (not shown). These controls demonstrate that IL-10 staining in live cells accurately reflects cytokine production by individual CD8α+ DC and, under the conditions used here, is not marred by paracrine effects. To determine the frequency of CD8α+ DC producing IL-12, intracellular staining was conducted for the p40 subunit after stimulation with CpG plus CD40L. Compared with baseline staining with an isotype-matched control Ab, essentially all CD8α+ DC stained for IL-12 p40 (Fig. 5⇓B). In other experiments, ∼15% of CD8α+ DC could also be stained for the bioactive heterodimer, IL-12 p70 (Fig. 5⇓B). Single cell staining of CD8α+ DC for IL-10 and IL-12. A, A 1:1 mixture of labeled live and fixed CD11c-enriched C3H/HeJ spleen cells was cultured with either control fibroblasts or zymosan (50 μg/ml) plus CD40L-expressing fibroblasts as indicated. Cells were assessed for IL-10 production as detailed in Materials and Methods and analyzed by flow cytometry. Left, Dot plots show IL-10 vs forward scatter profiles of gated CD8α+CD11c+ DC (FITC+TC− for live or FITC−TC+ for fixed). Right, The same mixture of live and fixed DC was coated with IL-10 capture reagent and incubated ± exogenous IL-10 (10ng/ml) and then stained with anti-IL-10 and CD8α; histograms show IL-10 staining of CD11c+CD8α+ DC gated as above. B, CD11c-enriched C3H/HeJ spleen cells were cultured either alone or with CpG DNA (1 μg/ml) plus CD40L-expressing fibroblasts. Brefeldin A was added after 4 h, and cells were harvested and fixed 2.5 h later. Cells were permeabilized and stained with Abs to IL-12 p40 or with isotype control Abs, counterstained for CD11c, DEC-205, and CD8α and analyzed by flow cytometry. Dot plots show IL-12 vs forward scatter profiles of CD8α+DEC-205+CD11c+ cells. C, Similar to B, using cells from BALB/c mice and staining for IL-12 p70. Dot plots show IL-12 vs forward scatter profiles of CD8α+ CD11c+ cells. Data for A–C are representative of three to four independent experiments. 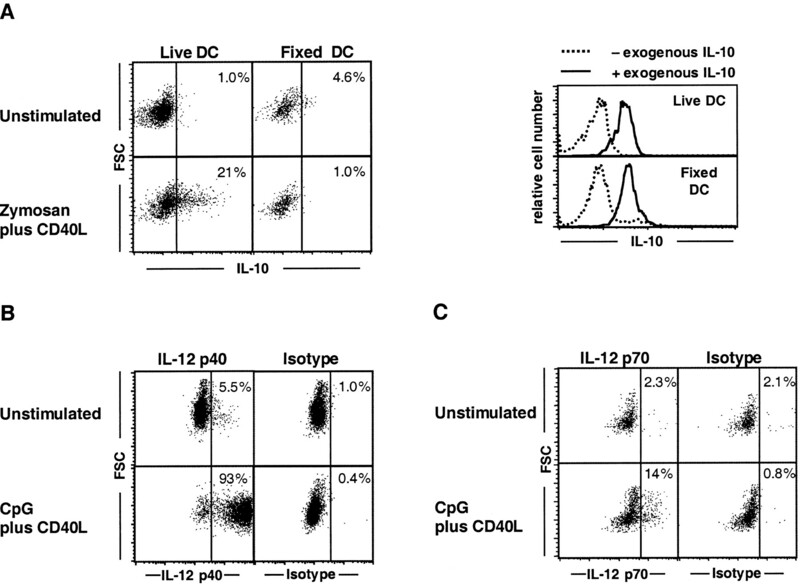 Unlike CD8α+ DC, CD4+ DC were unable to produce IL-12 p70 (Fig. 4⇑B). To determine whether this was due to autocrine effects of IL-10, DC subsets were cultured on CD40L-expressing fibroblasts in the presence of neutralizing anti-IL-10 Ab. Anti-IL-10 led to an increase in IL-12 p70 production by both CD8α+ and DN DC in response to PPD, which served as a positive control for neutralizing activity. However, IL-10 neutralization did not reveal the ability of CD4+ DC to make IL-12 p70 (Fig. 6⇓). Anti-IL-10 also did not change the nature of the response to zymosan or S. pombe in that the yeasts still failed to condition mixed DC populations or the CD8α+ and DN DC to make IL-12 p70 (Fig. 6⇓). These results confirm that both CD8α+ and DN DC are able to produce either IL-12 or IL-10 and show that IL-10 is not responsible for the lack of IL-12 secretion by CD4+ DC. Lack of IL-12 p70 production in response to zymosan plus CD40L is not due to suppression by IL-10. CD11c-enriched cells (90% DC; 4 × 104/well) or sorted DC subsets (5 × 104/well) from B6 mice were cultured overnight on CD40L-expressing fibroblasts with the indicated microbial stimuli in the presence of 10 μg/ml of a neutralizing anti-IL-10 mAb or a control rat IgG1 of irrelevant specificity. IL-12 p70 levels in supernatant were measured by ELISA. Doses: PPD, 10 μg/ml; zymosan, 20 μg/ml; and S. pombe, 1 × 105particles/well. Histograms represent the mean of triplicate wells; all error bars are shown and represent 1 SD from the mean. N.D., Not detectable. Data are representative of five experiments with CD11c-enriched cells and two experiments with sorted subsets. Differences in the cytokine response of DC subsets to yeasts vs IL-12-promoting stimuli could conceivably arise from quantitative differences in DC activation. In that scenario, the degree rather than the quality of DC activation might determine IL-12 p70 vs IL-10 production in response to CD40 cross-linking. This could be especially relevant because cytokine secretion requires CD40 signaling and CD40 expression is altered by the microbial stimulus itself (Fig. 1⇑). To examine whether the quantity of DC activation affected cytokine production, we chose two prototype IL-12 p70- and IL-10-promoting stimuli (PPD and zymosan, respectively) and examined their ability to 1) induce up-regulation of CD40 and CD86 and 2) promote IL-12 and IL-10 production across a whole dose-response range. There were no obvious differences among DC subsets in sensitivity to either zymosan or PPD in terms of CD86 up-regulation, although CD8α+ DC were more sensitive to PPD than either CD4+ or DN DC when assessed for CD40 expression (Fig. 7⇓A). Importantly, PPD conditioned CD8α+ and DN DC to make IL-12 p70 across the entire dose range (Fig. 7⇓B). Similarly, zymosan conditioned all three subsets of DC to produce IL-10 at all doses (Fig. 7⇓B). The fact that at no point in the dose-response did PPD become an IL-10 inducer or zymosan become an IL-12-promoting stimulus (Fig. 7⇓B), demonstrates that qualitative rather than quantitative differences in microbial recognition lie at the heart of differential cytokine responses by DC subsets. 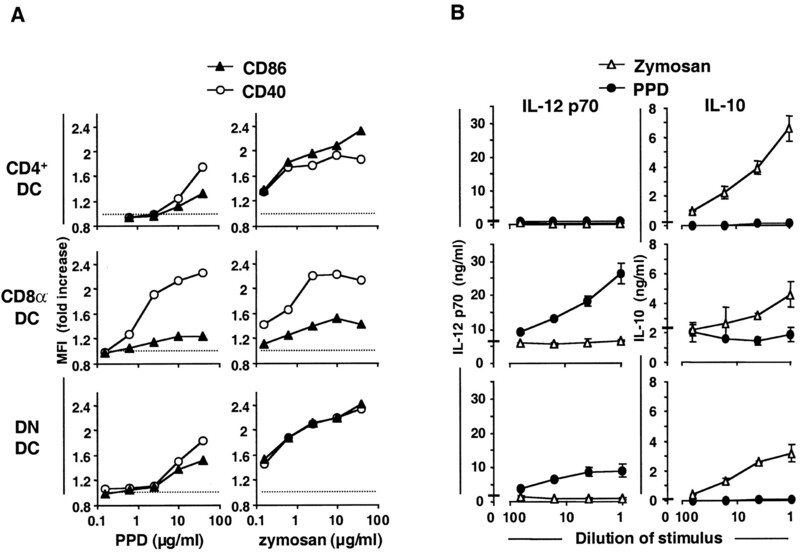 Differences in cytokine production induced by zymosan and PPD are dose independent. Sorted B6 DC subsets were cultured overnight with varying doses of PPD or zymosan and analyzed for surface marker up-regulation or cytokine production. A, Sorted DC subsets (6 × 104/well) were cultured with the indicated concentrations of PPD or zymosan. Duplicate wells were pooled, stained for CD11c, CD40, and CD86 and analyzed by FACS. Mean fluorescence indices (MFI) are expressed as fold increase over medium alone (·····). B, DC subsets (6 × 104/well) were cultured overnight on a monolayer of CD40L-expressing fibroblasts with serial dilutions of PPD or zymosan, and supernatants were analyzed for IL-12 p70 and IL-10 by ELISA. Top concentrations were 40 μg/ml for PPD and 10 μg/ml for zymosan; cytokine production with CD40L alone is indicated as 0. Data are the mean of duplicate wells (triplicate for 0). All error bars are shown and represent 1 SD from the mean. Data are representative of three independent experiments. Cytokines made by APC play a critical role in responses to infection. Here, we demonstrate four distinct features of cytokine production in murine DC. 1) The activation of individual DC subsets does not result in a preprogrammed pattern of cytokine secretion; it can lead to IL-10 or IL-12 production by CD8α+ and DN DC and to IL-10 production or lack thereof by CD4+ DC. 2) Cytokine production can be dictated by direct microbial recognition. Microbial structures from Toxoplasma and Mycobacterium or CpG-containing DNA condition DC to make IL-12 p70. In contrast, heat-killed yeasts (brewers’ yeast, fission yeast, C. albicans) or yeast derivatives (zymosan) condition DC to make primarily IL-10. 3) Differential conditioning is dependent on distinct PRR; PPD and CpG DNA act through TLRs and an MyD88-dependent pathway, whereas yeasts act via a TLR-independent pathway. 4) PRR signaling results in limited cytokine production unless is it followed by signals from T cells which amplify DC activation but do not alter the type of cytokine that is made. TLRs have emerged as key players in DC activation (2, 3). Consistent with this notion, the IL-12-promoting effects of PPD and STAg are absolutely dependent on signaling via MyD88 (Fig. 3⇑ and Ref. 26). PPD contains traces of bacterial DNA, and some of its IL-12-promoting activity can be removed by DNase treatment (A. D. Edwards and C. Reis e Sousa, unpublished observations). However, most of the DC response to PPD appears to be due to TLR2 triggering (Fig. 3⇑C), consistent with the fact that this TLR is involved in recognition of mycobacterial lipoarabinomannan and mannosylated phosphatidylinositol (27, 28, 29). TLR2 has also been implicated in the activation of macrophages by zymosan (21, 22). Given that DC express functional TLR2 (as determined by its involvement in PPD recognition), it is therefore surprising that zymosan failed to condition DC for IL-12 production even when IL-10 was neutralized (Fig. 6⇑). It is possible that zymosan recognition in macrophages involves heterodimerization with another TLR, which is not expressed on mouse DC. Alternatively, recognition of zymosan by an IL-10-promoting PRR on DC is dominant over TLR2 recognition of the same particle and overwhelmingly conditions the cells for IL-10 production. Indirect support for this hypothesis comes from two observations: 1) in some experiments, the combination of zymosan plus CD40L slightly increased the level of IL-12 production compared with CD40L alone (e.g. Fig. 4⇑B); 2) TLR2−/− DC reproducibly made more IL-10 in response to zymosan plus CD40L than controls, as if the IL-10-promoting PRR was now acting unopposed (Fig. 3⇑B). The identity of the IL-10-promoting PRR for yeasts on DC is unknown at present, but it is unlikely to belong to the TLR family as it does not signal via MyD88 or TIRAP/MAL (Fig. 3⇑). This would be consistent with the notion that TLR signaling is involved primarily in induction of IL-12 and type 1 adaptive immune responses (4). We have previously suggested that CD40 signaling in DC acts to amplify innate signals for IL-12 production (13). Here, we show that CD40L is just as critical for amplifying IL-10 secretion (Fig. 2⇑). This may seem contrary to the prevalent view that CD40 signaling leads to IL-12 production by DC (30, 31). However, CD40 signaling also induces IL-10 in monocyte-CSF-primed monocytes (32) and in human monocyte-derived DC exposed to glucocorticoids (33). Furthermore, our data fit with recent experiments showing that CD40 expression by bone marrow-derived DC is critical for priming of a Th2 response to Schistosoma mansoni eggs (34). Thus, CD40L and other T cells signals appear to act as neutral amplifiers that are critical for execution of cytokine production programs initiated by pattern recognition. Indeed, analysis of a large panel of IL-12-promoting stimuli shows that, like PPD, most trigger production of the IL-12 p40 subunit but induce little IL-12 p70 until combined with CD40L (A. D. Edwards and C. Reis e Sousa, unpublished observations). Apparent exceptions are CpG DNA and STAg, which can induce production of bioactive IL-12 p70 by murine CD8α+ and DN DC in the absence of T cell signals (Fig. 2⇑ and Refs. 12, 13). However, CD40 ligation still increases greatly IL-12 p70 production in response to these two stimuli (Fig. 2⇑ and Ref. 13). The ability of microbes to influence production of IL-12 or IL-10 is not without precedent. Gram-negative bacteria preferentially induce IL-10 production in monocytes, whereas Gram-positive bacteria induce IL-12 (35). A recent report shows that a protein from Bordetella pertussis induces IL-10 production in DC (36). However, our use of inactivated microbes and microbial extracts as tools to dissect DC biology raises the question of whether our findings are of significance to natural infections with intact organisms. Production of IL-12 by DC in response to STAg, PPD, or CpG DNA has obvious implications for the development of protective type 1 immune responses to Toxoplasma, Mycobacterium, and other bacteria. The significance of IL-10 production in response to heat-killed yeasts is less clear. Protection from murine and human candidiasis involves primarily Th1-biased responses, even though a role for IL-10 has been suggested (37). Live Candida yeasts trigger IL-12 production by splenic DC (38), and live recombinant yeasts elicit IL-12 production by bone marrow-derived DC (39). Thus, conditioning of DC for IL-10 production in our experiments could reflect preferential destruction by heat treatment of IL-12-inducing yeast components. It has been argued that different DC subtypes are specialized to make different cytokines and drive distinct forms of T cell differentiation (7). In support of this notion, human blood contains monocytes and plasmacytoid cells that can generate distinct DC1 or DC2 that prime Th1 or Th2 responses, respectively (40). These cells also express distinct TLR repertoires and respond to different microbial stimuli (8, 9, 10). In mouse, CD8α+ and CD8α− subsets of spleen DC differ in their ability to make IL-12 in vitro and in vivo and to prime Th1 and Th2 responses in vivo (12, 13, 24, 25, 41, 42). However, there is also evidence that individual DC types are not necessarily precommitted DC1 or DC2. In both mice and humans, the ability of DC to produce IL-12 p70 and prime Th1 responses can be modulated by exposure to cytokines (24, 43, 44). In addition, mouse DC can produce either IL-12 or IL-4 in response to different forms of the fungus C. albicans and direct Th1 or Th2 development (38). Similarly, murine bone marrow-derived DC treated with LPS or Gram-negative bacteria preferentially prime Th1 responses while cells exposed to certain worm products direct Th2 development (34, 45). In the human system, pathogen products have also been shown to dictate the cytokine producing and Th-skewing capacity of monocyte-derived DC (46). Even so-called DC2 plasmacytoid cells can make IL-12 in response to CpG DNA plus CD40L (9) and can prime Th1 responses after exposure to viruses (47, 48), arguing that their Th2-directing ability is not hardwired. Consistent with the notion of flexibility, here we show that DN and CD8α+ DC subsets have a choice of effector cytokines. It remains possible that these DC subsets are heterogeneous and contain DC precommitted to either IL-12 p70 or IL-10 production. However, using single-cell staining methods, we were able to show that up to 30% of CD8α+ DC could produce IL-10 when given zymosan plus CD40L (Fig. 5⇑A), and >90% of CD8α+ DC could make IL-12 p40 in response to an appropriate combination of stimuli (Fig. 5⇑B and data not shown). Therefore, we suppose that at least 15–20% of CD8α+ DC are bipotential for IL-10 and IL-12 p40 production. This is probably an underestimate, as the staining method for IL-10 involves cell resuspension, which disrupts continued CD40 engagement and stops cytokine synthesis (A. D. Edwards and C. Reis e Sousa, unpublished observations). Whether bipotentiality extends to IL-12 p70 production could not be unambiguously determined as only up to 15% of CD8α+ DC can be stained for the cytokine (Fig. 5⇑). However, IL-12 p70 is produced at 10- to 50-fold lower levels than IL-12 p40 (49) even after CD40-dependent up-regulation of IL-12 p35 (13) and is extremely difficult to detect by staining. Therefore, again, our staining is likely to provide only a gross underestimate of the true frequency of IL-12 p70-producing cells. Thus, we favor the notion that most CD8α+ and DN DC have the potential to produce alternative cytokines in response to distinct stimuli. This does not exclude the possibility that some DC subsets may have functional specializations, exemplified by the apparent inability of CD4+ DC to produce IL-12 p70 in response to a large panel of stimuli (Figs. 4⇑, 6⇑, and 7⇑ and data not shown), also seen by Hochrein et al. (25). CD4+ DC represent ∼50% of splenic DC and constitute the majority of DC in the CD8α− fraction, which may underlie the observed tendency of CD8α− DC to induce Th2 responses (24, 41, 42). However, even CD4+ DC do not have a prewired response to activation: they are activated to a similar degree by zymosan and PPD as measured by CD40 and CD86 up-regulation, yet zymosan conditions the cells to make IL-10 whereas PPD does not (Fig. 7⇑). Altogether, these results suggest a model in which all DC irrespective of subset can behave as flexible APC. The fact that innate signals and T cell feedback are both necessary and sufficient for cytokine production by all DC subsets can, therefore, explain Th polarization by these APC without invoking the participation of third-party cells or cytokines. We thank A. Lehmann and C. Lehane for S. cerevisiae and S. pombe cultures and S. Vogel for LPS. We are grateful to C. Simpson, A. Eddaoudi, and G. Warnes for cell sorting and G. Hutchinson and J. Bee for animal care. We thank N. Hogg and D. Cantrell for comments on the manuscript. ↵1 This work was supported by Cancer Research U.K.
↵3 Abbreviations used in this paper: PRR, pattern recognition receptor; PPD, purified protein derivative of Mycobacterium tuberculosis; DC, dendritic cells; STAg, soluble tachyzoite Ag; TLR, Toll-like receptor; CD40L, CD40 ligand; DN, double negative; TIRAP, Toll/IL-1R domain containing protein. Fitzgerald, K. A., E. M. Palsson-McDermott, A. G. Bowie, C. A. Jefferies, A. S. Mansell, G. Brady, E. Brint, A. Dunne, P. Gray, M. T. Harte, D., et al. 2001. Mal (MyD88-adapter-like) is required for Toll-like receptor-4 signal transduction. Nature 413:78.